Photograph of Germania Hall, a hotel built in 1873 by Peter Dagan. The building was rebuilt after a fire in 1890, extending it double in length. In 1908, Louis Palenske (later Palenske Hall) purchased the building to house the new Commercial National Bank, and the Feiden Brothers constructed a new front for the building and rebuilt the interior. 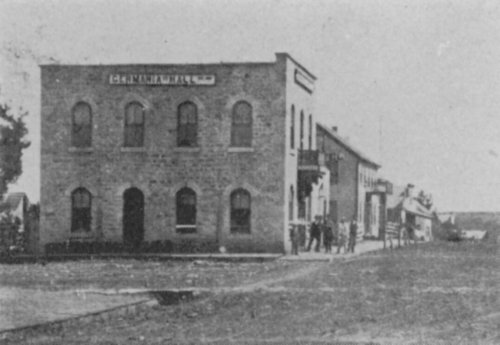 Beyond Germania Hall in the photo is the first Winkler Hotel, the third building constructed in Alma. This image was taken from Matt Thomson's book "Early History of Wabaunsee County, Kansas with Stories of Pioneer Days and Glimpses of Our Western Border."